"Feel like you are wasting so much water lately? 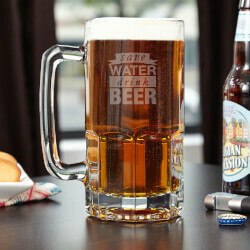 You can do your part to help save the environment by drinking more beer with our colossal beer mug! Holding a full liter of your favorite brews, this beer mug is just what you and our environment needs to help conserve the valuable water supply. Coming laser engraved, each mug is dishwasher safe and way more eco-friendly than your boring red plastic cups. Crafted from high-quality glass, they feature a thick glass base and sturdy handle for the ultimate drinking experience. Making a fun gift for any beer enthusiast, these colossal beer mugs measure 8 tall and will save plenty of water.Made of solid glassLaser engraved with our ""Save Water Drink Beer"" designDishwasher safeMeasures 8"" tall and can hold 1 liter"